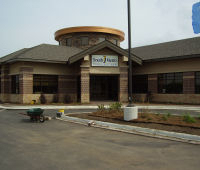 South Metro Federal Credit Union was established in 1993, as a member-owned, not-for-profit financial cooperative for everyone living or working in Scott County, Minnesota and for members and members of those members belonging to the North Country Development fund. We are a non-profit, member-owned financial institution governed by our members. Since we have no outside stockholders, all earnings are retained in the credit union. Thus we generally pay higher returns on savings and charge lower interest rates on loans than other financial institutions. Once operating expense and reserve requirements are satisfied, the income generated by loans and investments is returned to the members in the form of dividends and expanded low-cost services. Your deposits are insured up to $250,000 by the NCUA, and independent agency of the the US Government. We also provide an additional $150,000 depository insurance by Excess Share Insurance. .
As a credit union member, you are not a ''customer'' but a member and part-owner of a financial cooperative in which all the members pool their resources to help one another. Stop in today or visit our website to learn more! Our main office is located at 2573 Credit Union Drive in Prior Lake, across from Mystic Lake Casino;off of County Road 83..